How to Upload Spotify Playlists to YouTube & YouTube Music? YouTube is the most popular video hosting site on which users can upload music videos for being discovered by others. Based on the popular features of YouTube and Google Play Music, YouTube Music joins as a newcomer of streaming music service, and it will be the competitor of Spotify, Apple Music and other popular streaming music services. Maybe you want to switch from Spotify to YouTube Music and already have your subscription. And you may ask that there is any idea about how to get your playlist from Spotify to YouTube Music? So this article will introduce you guys an ultimate solution on how to upload Spotify music or playlist to YouTube and its streaming music service YouTube Music. As Google’s streaming music services, users are very glad that local music uploads will be the part of the plan for YouTube Music, just like the way of Google Play Music. However, when you are trying to upload your Spotify music or playlist, you will find that the DRM layer on Spotify streaming music stops you from copying Spotify music or playlists to other music or media player. 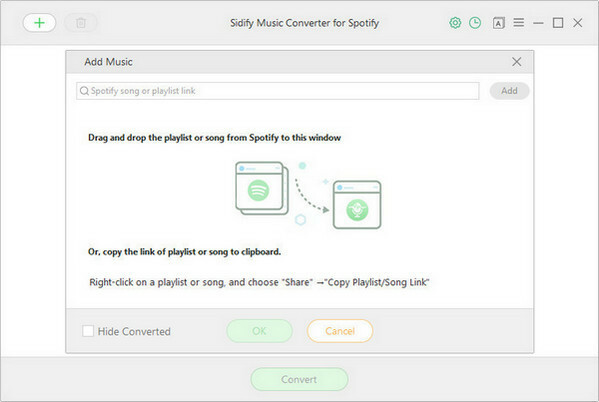 So before you start, you can use Sidify Music Converter for Spotify to get DRM free music or playlists as MP3, WAV etc from Spotify. Convert Spotify music/playlist/podcast to MP3/AAC/FLAC/WAV. 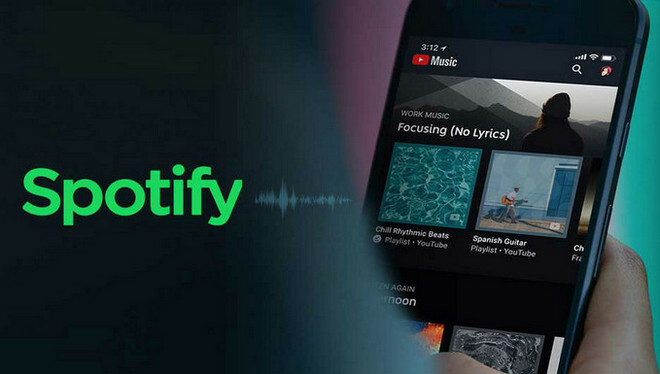 In the following part, we will show you how to upload Spotify music to YouTube and its streaming service: YouTube Music. Download and install Sidify Music Converter for Spotify on computer, then launch it. Spotify app also will be loaded automatically. Click on "+" icon at the top left and a new window will be shown, and you can drag & drop Spotify song or playlist to this adding window directly. Or you can copy song or playlist link from Spotify to the clipboard. Then click "OK" to add the Spotify music to the main interface. Tap on button at the top right and you can change the output format, output quality, conversion mode and output path from this pop-up window. Here you can choose MP3, AAC, WAV,or FLAC as the output format. 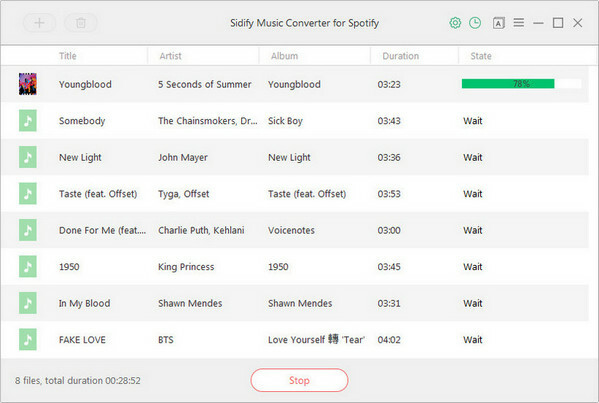 Sidify Music Converter for Spotify supports saving output audio into Artist, Album, Artist/Album, or Album/Artist folder, so that you can better organize the music library. 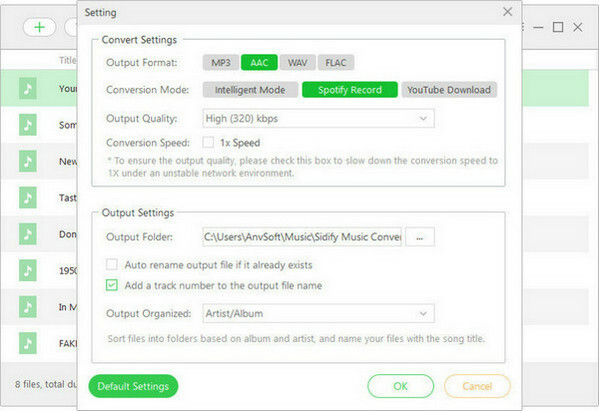 Click on "Convert" button to start converting Spotify songs, playlists or podcasts to DRM-free audio files. After the conversion completed, you can click icon to find the well converted Spotify music. 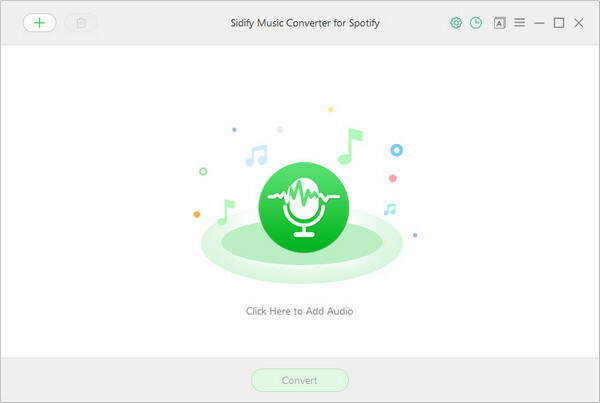 With Sidify Music Converter for Spotify, all Spotify music, playlists or podcast would be successfully converted to DRM free audio files and saved to your local drive, and now you can feel free to upload them to YouTube channel or YouTube Music. You are trying to share your favorite music lists with others on YouTube channel, but only to find that only video files are allowed to be uploaded to its server. Do not worry, the easiest way would be inserting a single image (or multiple images as a slideshow) as a video to editing software like Adobe Premiere, Final Cut Pro, Windows Movie Maker, VSDC, iMovie, and etc, then add the converted Spotify music . Finally, you can save it and upload to YouTube. It was already confirmed that YouTube Music will take on all of the key features of Google Play Music, including the ability of local music uploads. So after the several updates, you will be allowed to upload your converted Spotify music to this new streaming service for enjoying on multiple devices.